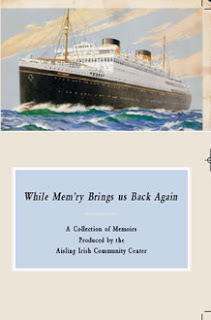 New York’s Aisling Irish Community Center’s collection of memoirs written by Irish immigrants who arrived between 1927 and 1964 has become a hit. One local paper calls “While Mem’ry Brings Us Back Again” the “‘it’ gift” of the holiday season. The Journal News reports that the first edition of 1,500 copies has already sold out, with orders coming from as far away as Massachusetts, Florida, California and Ireland. A second printing is due in January. On a personal note, your correspondent ordered the book as a gift for her father, a Kilkennyman who left for New York in 1963 – only to find he had not only already read the book but had also bought three copies to give to friends. Read the Journal News article. Read the original post on the project. Order the book from the Aisling Irish Community Center. The Minister for Foreign Affairs, Dermot Ahern, has met with representatives from the Irish Lobby for Immigration Reform (ILIR) in New York to discuss the campaign on behalf of undocumented Irish immigrants in the United States. The minister reiterated the Government’s strong support for the ILIR’s campaign. He added, “The plight of the undocumented gets harder by the day and the ILIR campaign has undoubtedly already had a strong impact in Congress and beyond. The Government will remain actively involved in representing the concerns of the undocumented in the crucial period ahead.�? The Minister praised the work of the centres, saying, “The services offered by the Irish immigration centers are critical, particularly for the more vulnerable members of our communities here. I welcome the ongoing focus on supporting community networks and the development of services for older Irish people in this country. The work that the centers undertake to respond to the particular difficulties encountered by the undocumented in their communities is also of key importance�?. See the Department of Foreign Affair’s press release.